Always keen to embrace anything that helps the environment we spotted The ‘reECo’ coffee cup. It is a fully recyclable cup that places the environment at the heart. 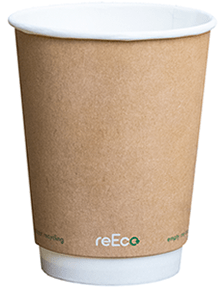 It gets around the underlying problem by ensuring that both the inner and outer layer of the coffee cup can be recycled. The interior lining is made from a material called ‘EarthCoating’ rather than the traditional PE or PLA, and this can easily be separated during the standard recycling process. What this means is that they can be processed alongside standard paper recycling as if there wasn’t even a coating on them.